Written by Robert Schmidt with assistance from John Morrison. Sometimes an identical product will be sold in different countries under different brands. Such is the case with this instalment of” From The China Desk”! Today we are looking at two coolers from Scythe, but you may recognize the products this time. They are sold outside of Asia as the Thermaltake Galaxy i1 and i2 coolers. 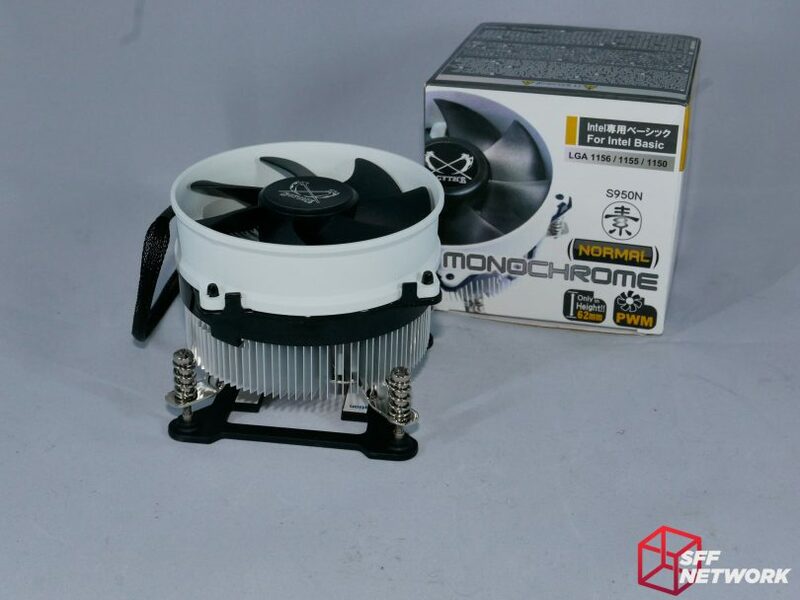 In Asia you can find them as the Scythe S950M “Slim” and S950N “Normal” Monochrome CPU Coolers. Scythe started in 2002 from what could be seen as the soul of the DIY Computer industry, Akihabara Electric Town in Tokyo Japan. 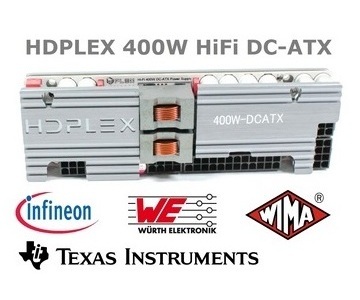 It has since gained a reputation for high quality products, specializing in cooling and fans. Let’s see if these coolers live up to the brand name. Installation on both is also easy and simple. Screws attached to the cooler can be tightened down onto the provided plastic backplate. Within minutes you will be up and running on either cooler, provided you have a cut-out on your case for rear side of the CPU socket. The S950N Slim variant has a relatively unusual reverse fan setup, with the motor hub on the intake side of the fan. Significantly shorter than the stock Intel cooler! The Scythe’s mounting mechanism is also a much better design in our opinion. Looking at the bottom of the cooler, we can see the copper slug at the centre of the heatsink. 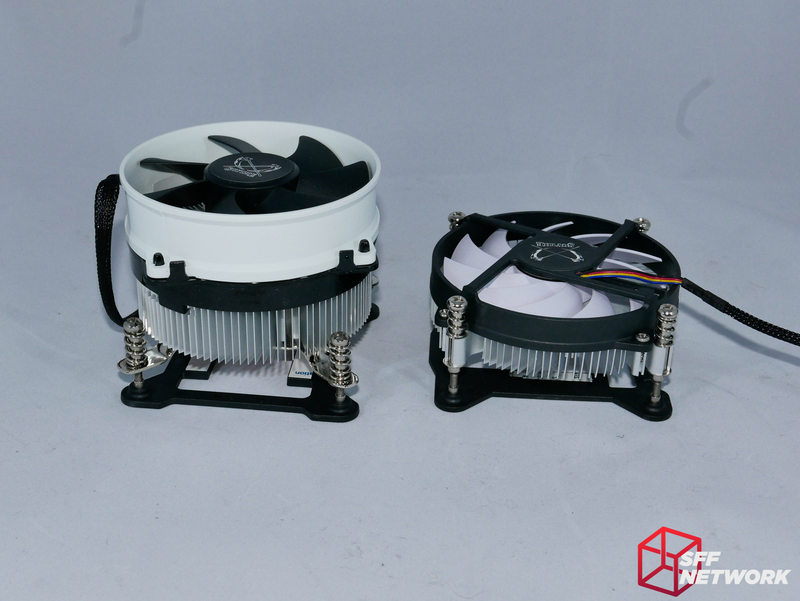 This build method has been popular in cheaper downdraft coolers, with even previous generation Intel stock coolers using such a design. 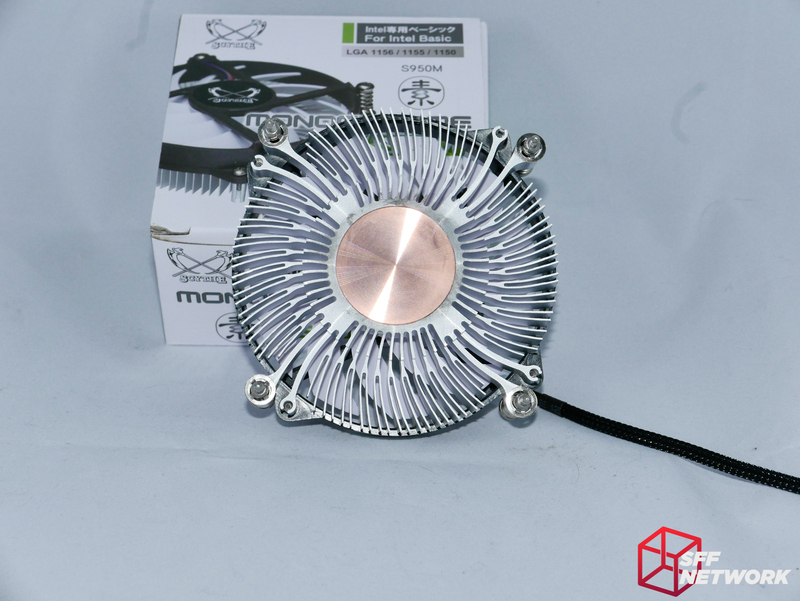 You will need access to the rear of your motherboard to install this cooler – a backplate is required (and included with the cooler). The larger S950N, whilst being a only slightly different name, has quite a few changes. 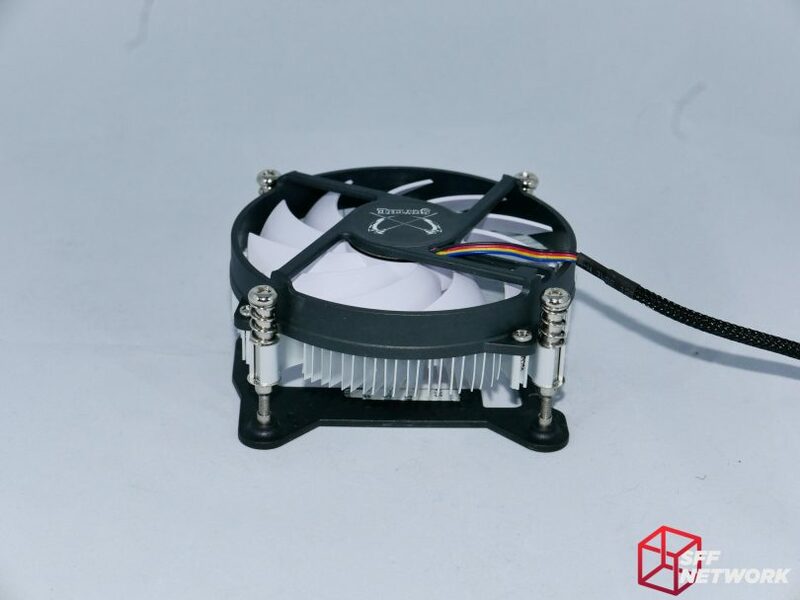 Gone are the slim fan and the mounting mechanism integrated into the extrustion, replaced by a much thicker fan, and a retro-style mounting plate that is pressed onto the bottom of the cooler. The copper core is still here though. Looking at this cooler brings me back to the LGA775 days! Both coolers are similar in design. As to be expected with the name, they sport a monochrome black and white color scheme. The 950M “Slim” features an upward facing fan motor and ultra low profile layout with 31mm clearance, while the 950N “Normal” is a downdraft cooler that comes in at a taller 62mm clearance. Both have a 92mm fans but running at slightly different speeds, though both are PWM capable. Also, they do not rely on copper heat pipes, but rather a solid copper core with an aluminum extrusion radiating heat from the center. The S950M and S950N run a close race to each other in our various tests, but both lag behind the stock Intel cooler. At such a cheap price, this is not a huge disappointment (assuming you can’t use the Intel cooler for whatever reason). For the 950M Slim it’s acceptable as it’s niche is the ultra compact. For the S950N, it would have been nice to see better numbers considering the larger size. Overall performance was tested on an overclocked Intel Pentium G3258, overclocked from the stock 3.2GHz to a 4.0GHz. Each cooler was tested for 15 minutes of Prime 95 to find the peak temperature reached. Delta temps (in Celsius) above ambient are provided in the table below. It would seem obvious that the taller 950N “Normal” would outperform the smaller 950M “Slim”. Obvious seems to have taken a vacation however (Editor: How lucky! ), because it oddly did not perform any better than its’ smaller (and cheaper) sibling. Compared to the Intel Stock cooler for Haswell processors, both came up short. However, the 950M “Slim” would still be of interest for most as the ultra-low profile design makes it appealing for SFF builds. 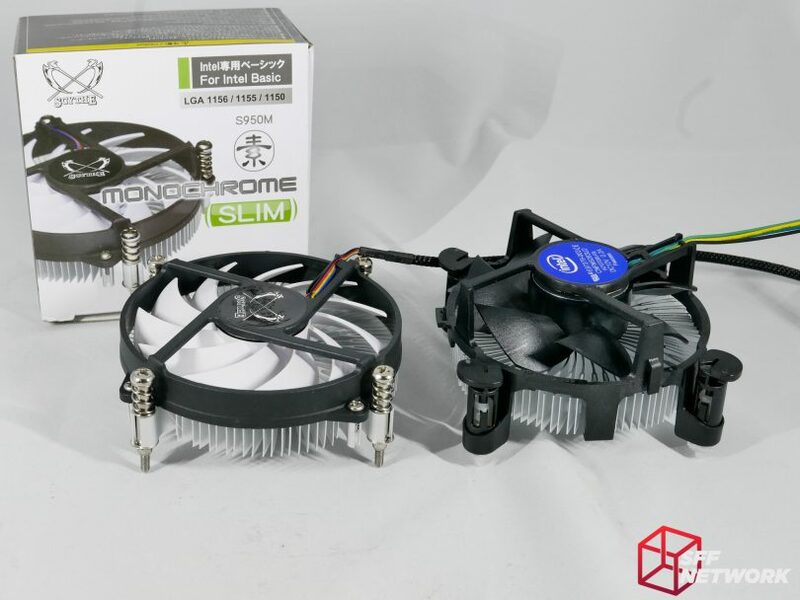 The S950M “Slim” fan speed reached a higher 2755 RPM while the S950N “Normal” only ramped up to 2083 RPM, similar to the specifications provided. This helps explain the similarities in performance, and also means the S950N will achieve similar temps to its smaller sibling but won’t drive you insane with the fan noise at the same time. In the more realistic testing with fan speeds set to “Silent” in the BIOS, the two Scythe coolers closed the gap with the Intel Stock cooler, but still trailed behind. Since all of these coolers use integrated fans, it’s not possible to try an alternative fan like the Noctua NF-A9x14 without serious modification, as a result I cannot compare to see if a higher speed fan on the S950N “Normal” might improve its performance over the S950M “Slim”. The S950N and S950M are both decent offerings at a very low price, however the S950N “Normal” is hard to see a market for. As a stock Intel cooler replacement, it does its job. Slightly higher temps but less fan noise and good aesthetics. 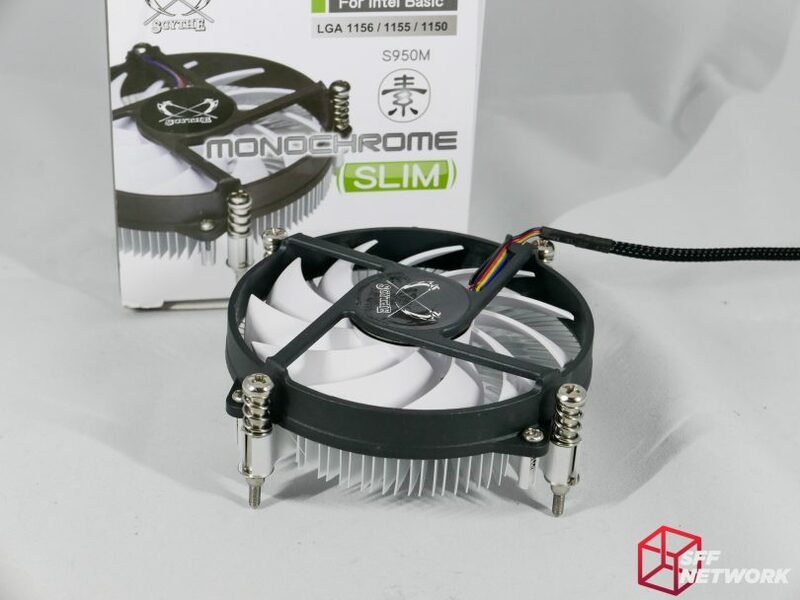 The S950M “Slim” has more of a market, especially for those who need a very low profile cooler. It still offers reduced fan noise over the Intel stock cooler, also at increased temperatures. It also offers much better aesthetics for those in need of that. In summary, don’t expect amazing performance out of these coolers. If you are in need of a decent looking budget cooler and aren’t too concerned about performance, these would be a good choice. 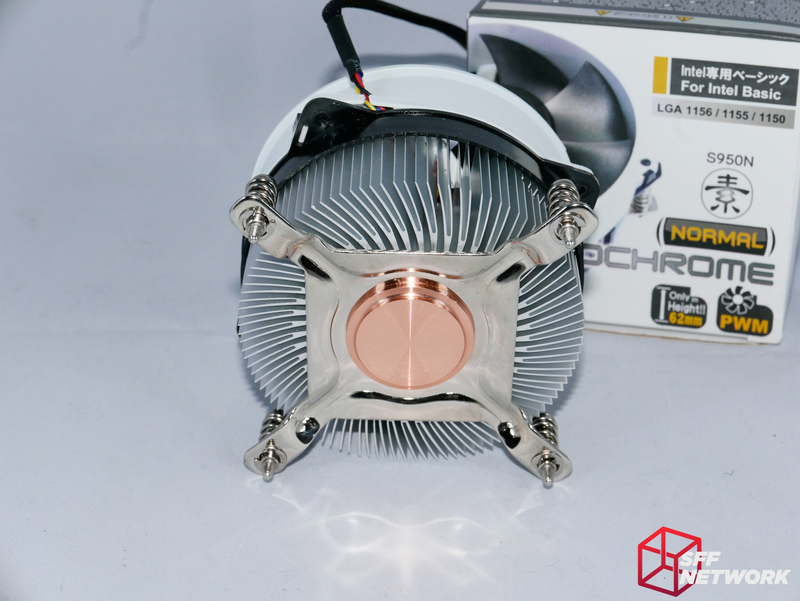 If you are looking for an improvement over your stock cooler, I’d suggest looking elsewhere, like at our last review of the ID-Cooling IS-40 v3. Thoughts? Leave them in the forum!